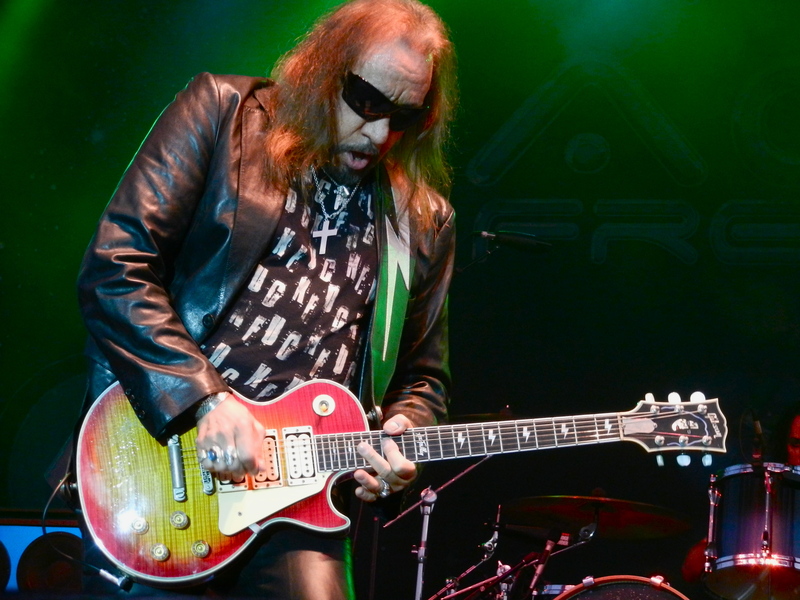 Wednesday night’s free concert at the Erie County Fair brought together both fair goers and metal heads alike when legendary former KISS guitarist, Ace Frehley rocked the grandstand at the Hamburg Fairgrounds. It had been more then three years since the original self addressed space man had his way with an eager Western NY crowd and Wednesdays show only proved that he would benefit from playing in the area more frequently. The small but steady die hard KISS and Frehley fan base began lining up to the gate at 3:00 PM sharing stories of past encounters featuring their childhood hero and his peers from the past. With a prompt 8 PM start time, “Fractured Mirror”, an instrumental rarity from Frehley’s 1978 solo album, played over the speakers. Blue mirrored guitar amps, new to this tour, were unveiled to a giant roar and applause from the assembled in attendance. At the conclusion of the intro, Ace arrived on stage to guitar feedback and cymbal hits before launching into the long lost Alive II studio gem of KISS’ Rocket Ride. Immediately besieging with another track from the shock rock kings of the 1970s “Parasite”, Frehley and his band gave the people what they came for, pure, no frills rock and roll. The set was heavily concentrated on material from Frehley’s former band which noticeably was what the casual fans wanted to hear. However, the true die hards in attendance clearly wished for more nods to Ace’ entire back catalog which sadly was not obliged only touching on one song from his three album solo career in the 80’s. “Rock Soldiers” from 1987’s Frehley’s Comet and “Sister”, a rehashed 90’s demo that made its way to his recent solo album “Anomaly” were the only two songs played that were not associated with KISS. Focusing on playing songs from his KISS career wasn’t the only thing that too closely resembled a show from them .As the singing patterns of drummer Scot Coogan followed a strict pattern mirroring the likes of KISS bassist, Gene Simmons. This was extremely noticeable during the hit “Shout It Out Loud” where Coogan and Frehley switched lead vocals throughout the song. Proceeding into the above mentioned song, Ace must’ve been back on planet Jendell for a minute as he accidentally began playing the intro to the track that would follow. A quick joke and laughs from the crowed made for a funny and innocent error. That aside, the band played with high energy and musical chops, helping Ace to entertain everyone from the casual free concert goer to the rabid fanatic. Ace was greeted with a great reception throughout the seventy-five minute show and would surely be welcomed back anytime. Especially by his diehards who paid upwards of $200 to meet Ace before the show. I’m sure many of them would pay it again if they had to. The good- new Stage set, addition of Sister, No boring opening act to sit through.